Seeding Success works with partners throughout the community — from the classroom to higher education to policy — to improve student outcomes in Memphis, Tenn. It was a challenging number to comprehend for more than 400 high school seniors at a GradNation summit in Memphis, Tenn. Jaws dropped when they learned that only 11 percent of their peers were ready for college and only 55 percent actually enrolled in education opportunities beyond high school graduation. Throughout the event, students engaged with baseline education data in Shelby County, shared their reactions and addressed barriers to going to and succeeding in college. Students agreed that, above anything else, they needed more support. So that’s exactly what Seeding Success and local community partners set out to provide, while helping high school seniors to enroll in the Tennessee Promise — a new state program offering two years of free community college for every high school graduate in the state. From August until November 2014, Seeding Success and its partners focused on targeted outreach, media awareness and community-wide events. Leadership Memphis, a Seeding Success partner that leads the Post-Secondary Access Network, secured funds to launch a public campaign with yard signs and community calendar listing where parents could get support completing FAFSA applications from after-school programs and church groups. But perhaps the most important effort was weekly reporting from Shelby County Schools and Seeding Success to look at TN Promise enrollment and FAFSA completion by school. After looking through these reports each week, the partners and schools were able to better target outreach to students who needed additional support. “There was public reporting within the system and among principals and leadership so everybody who was concerned knew where each high school was in enrollment,” said Dr. Adriane Williams, Seeding Success director of collaborative action. In the first year of TN Promise, 60 percent of Shelby County Seniors remained enrolled by the February 15 FAFSA application deadline; the prior year only 48 percent had completed FAFSAs by that point. As of June, 83 percent had completed FAFSAs. In 2013, only 55 percent of high school seniors in Shelby County enrolled in a postsecondary opportunity. Increased FAFSA completion means more students are on the pathway to fall 2015 enrollment. “The TN Promise enrollment number was really shocking to a lot of people. We’re not considered particularly high performing in the state, so it was a celebratory moment for us,” Williams said. Based on the TN Promise enrollment success, partners have used similar data practices to help students complete their FAFSAs. The partnership will also help students to submit post-secondary applications and show up prepared — all of which help with their cradle-to-career path. 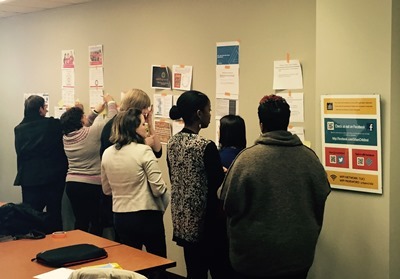 After the former Memphis superintendent visited the StrivePartnership in Cincinnati and Northern Kentucky, community leaders wanted to figure out how to replicate the partnership’s collective impact model in Shelby County. The community already had a cradle-to-career leadership organization, PeopleFirst, but lacked the on the ground facilitation and data functions critical to success. The ability of community leaders to leverage the strength of the existing local efforts and reinforce it with the StriveTogether framework and Theory of Action, led to the formal launch of Seeding Success. Leaders worked to get the right stakeholders and partners at the table before quickly adding a continuous improvement director to build data into its core values. Today, the partnership has five full-time staff and six collaborative action networks focused on kindergarten readiness, third-grade reading, college and career readiness, opportunity youth, postsecondary access and postsecondary attainment. Through the StriveTogether Cradle to Career Network, of which Seeding Success is a partnership, that world extends to more than 60 communities throughout the United States. Local partnerships join a network of collective impact professionals working in their communities to improve educational outcomes from cradle to career. Seeding Success has also been involved in focus groups to share their work with other communities throughout the country, and was one of five cradle-to-career partnerships to participate in a results-based leadership program through StriveTogether and the Annie E. Casey foundation. “That leadership training has transformed my work personally and led to a number of improvements across the partnership,” Williams said. “We would not have had that opportunity without being part of the network. For the greatest improvements on student outcomes, Seeding Success helps its partners use data throughout its work. By walking through process maps and identifying key indicators, Seeding Success helps partners to examine data and create strategies and interventions to drive improvement. To ensure high-quality throughout the work, partners who wish to access student-level data must first complete a five-hour online training and a day-long, in-person training on the continuous improvement process and standards for data sharing. The data workshops cover continuous improvement, ethics and the Family Educational Rights and Privacy Act, access and interpretation, and acting effectively, which are categories Seeding Success borrowed from the Data Quality Campaign. Memphis Athletic Ministries, a local organization that hosts after-school programs, matches students with mentors and organizes sports leagues, asked Seeding Success to train 30 employees in continuous improvement. Looking through attendance data for their after-school program participants, Memphis Athletic Ministries was shocked to learn that some of their students who showed up daily for programming had very poor school attendance. It was a game-changer. And recently, Memphis Athletic Ministries presented their findings to their fellow Seeding Success partners. Continuous improvement is integrated into the work of Seeding Success beginning with the data use training. It appears regularly in network meetings where members are reminded of where in the cycle they are as they work on specific strategies. And it informs individual consultations with partner agencies who are seeking to change their operations to be more aligned with the Seeding Success continuous improvement process. For example, through the TN Promise and FAFSA project, Seeding Success and its partners tracked and regularly examined data, and adjusted efforts based on what they saw. Using continuous improvement is not only leading to results with students, but improving the partnership as a whole. The partnership credits those successes to intentional data use, collective goals, talented staff and determined partners. Seeding Success is a diverse partnership representing K-12 institutions, nonprofits, business, health, civic, faith and philanthropic organizations that are committed to fearlessly pursuing education outcomes for children in Shelby County, Tenn. Each organization in the partnership agrees to focus on a common set of goals and to work through a collaborative action process together with other sectors. Seeding Success is an Emerging member of the StriveTogether Cradle to Career Network.